How did Alicia's first day back at work go? 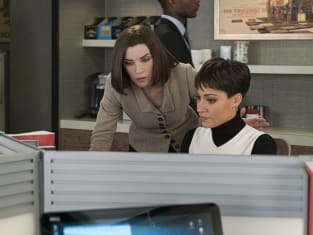 That question was answered on The Good Wife Season 7 Episode 14, as she returned to work at Lockhart, Agos and Lee with Lucca. Their first case didn't help any of the awkward vibes around the firm and caused quite a rift, in fact. The case involved a secret new computer tablet that could cause a disaster for anyone who uses it. Was Alicia be able to make any new friends? Use the video above to watch The Good Wife online for all the answers. You don't want to miss this one, trust us.